And now for something completely different. The Light L16 has gained a reputation for breaking away from camera-making orthodoxy. 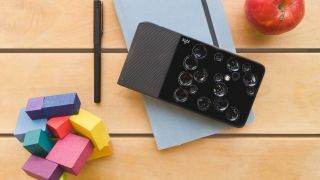 Eschewing the one-camera, one-lens approach, this pocket-sized model carries several small lenses and cameras lying at 45-degree angles across a flat plane, intelligently determining which of them to use for each shot. It's just been launched into the UK market, so let’s take a closer look at what it offers. Measuring 165 x 84.5 x 24.05mm, the L16 is small enough to slip into your pocket. It’s controlled via a 5in touchscreen on the rear, and has a rubberised grip for steady handling. The camera/lens modules on the L16 come in three flavours: 28mm, 70mm and 150mm. Each time the shutter is released, the camera chooses a specific combination of these to produce the final high-resolution image. These modules also give the user access to the full breadth of that 28-150mm focal range. The final image the L16 captures has a resolution of 52MP, although the amount of data captured by the camera also allows it to create a 3D depth map of the scene. This opens up options for post-processing, allowing the user to alter depth of field and focal plane after the shot has been taken. According to Light, the ten-cameras-at-once approach also means much better noise reduction. The L16 uses the Android operating system, which means it can download firmware updates for improved future performance. Light promises, for example, that the option to shoot 4K video will come to the camera shortly. Under the bonnet it carries a Qualcomm Snapdragon 820 processor, with a Light ASIC chip and a 4120mAh Lithium-ion polymer battery which provides up to eight hours of power. It also offers GPS and Wi-Fi and Bluetooth connectivity. The Light L16 is available now with a UK RRP of £1,850, but if you snap yours up before 31 March you can bag a generous 30% discount, which takes the price down to £1,295. See light.co for details.